Movies that sort of fall into that James Bond kind of niche are usually a good time. When said movie is a well-written, big budget, meta-aware semi-parody of the same, the result can be terrific... and that's exactly what Kingsman: The Secret Service is. It's based on a comic book series called simply The Secret Service, written by Mark Millar (who also wrote Wanted) and penciled by legendary comic artist Dave Gibbons (the man who drew the classic Watchmen). The movie version of Kingsman is written by Jane Goldman and Matthew Vaughn; Vaughn also directed. The plot is fit for 007 as well: a multimillionaire tech mogul sets out to save the Earth from the adverse affects of being home to humanity by using signals sent through Wi-Fi capable devices to drive people into murderous rages so they all kill each other. The only survivors would be the rich and powerful who sign on with this genius, Valentine, the always awesome Samuel L. Jackson, who manages to be hysterical and diabolical while brandishing a hysterical lisp. Valentine is opposed by the Kingsmen, a multi-national spy agency protecting the world in secret. They're all a bunch of Bonds who are named after Arthurian knights, like the suave yet deadly Galahad (Colin Firth, a surprisingly convincing badass here) and their leader Arthur (Michael Caine, as great as ever). 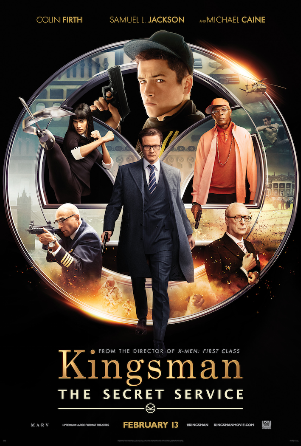 That is, until their Lancelot dies and the search goes out for his replacement, as each Kingsman must nominate a young student to assume the vacant position at the table; Galahad nominates Eggsy (Taron Egerton, who definitely holds his own against a very talented and accomplished cast). Eggsy is about as far from Bond as you can get, and his struggle to become a Kingsman is the emotional core of the film. And it's a great film. Matthew Vaughn is proving to be the right man for the job when it comes to action movies like this one, with the aforementioned Wanted as well as X-Men: First Class on his resume. He's a deft hand when it comes to action scenes and just as deft at the emotional stuff. The cast is great, from the stars I've already mentioned to the supporting cast; people like Mark Strong as Merlin, the Kingsmen's tech and support guy, and Sophie Cookson as another Lancelot candidate, Roxy. And the cast needs to be talented because the script Vaughn and Goldman crafted is smart, witty, and fast. Everything comes together here to make Kingsman: The Secret Service a great movie. I give it 4 out of 5 stars.